Peter Hasselbacher of Peoria was not the first Hasselbacher in Illinois. Page under construction. I will post maps, original documents and make links. Johann Peter Hasselbacher arrived from Germany in November 1857 and settled near Peoria, Illinois either immediately or within a year. There he began what is to my knowledge the second largest Hasselbacher family in America. (The largest is the Hasselbacher/Hazelbaker family, well described on this site.) 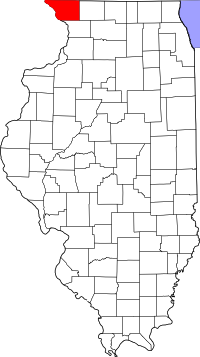 I have been predisposed to assume that all the early Hasselbachers of Illinois stemmed from the Peoria line, although certainly as the decades passed this would be an increasingly bad assumption. • Adam Hasselbacher 30-40, born between 1815 and 1825. • Farden 10-20 (a son). This census report would have the family of Adam Hasselbacher in Illinois at least 2 years before Peter Hasselbacher immigrated to Peoria! I found the same family again in the 1870 Federal Census living in "Pleasant Valley" of Jo Daviess County near the post office of Derinda. (These other place names appear to represent nearby administrative areas.) I have no knowledge of where in the area Adam would first have lived. • Margaret 61, keeping house, born in Bairne. • Ferano, 21 born in Switzerland. • Michael, 1 born in Illinois. • Adam 16, born in Illinois. This Adam was born about 1817. It is a little atypical that the names of the other family members are not listed in decreasing chronological order. Are all these the natural children Adam and Margaret? How did Ferano come to be born in Switzerland? Margaret is old to have a natural 1 year-old child. Error or extended family household? Much to my surprise and initial confusion, I found a second family headed by a different Adam "Hasselbacher" living in Jo Daviess Co. at about the same time. This second family also appears in the 1870 Federal census of Jo Daviess County and Thompson. • Adam Hasselbacher, 43, a day-laborer from Bairne. • Barbara 40 keeping house. • Adam 16, a day laborer. • John 2 months old born May 1870. This Adam was born about 1827. All but John are listed as born in Bairne [Bayrn, or Bavaria], and all have foreign-born parents. I am led to conclude that the family arrived from Europe sometime within the previous 6 years, between 1864 and 1870. Adam is a family name and hints that the two families of Jo Daviess Co. could conceivably be related even though the spelling of their last names diverges in the available records. There is a Illinois tax record from 1866 in which an Adam Heßelbacher of Elizabeth Township is listed twice– once as a person and again as a retail liquor dealer. I found an Adam Heßelbacher (Hesselbacher) naturalized 1860 in Jo Daviess County. Assuming a person had to wait 5 years before naturalization, this is likely Adam the liquor dealer who appears to have arrived even before Adam Hasselbacher, the farmer of Schapville. I found a tombstone photo of a John A. Hesselbacher (24 Jun 1827 to 18 Dec 1909) from the Elizabeth City Cemetery. (Sec D, Old Cemetery, Lot 65). A link in the cemetery records was made to a presumed spouse, Barbara Hesselbacher (1829-1910). This must be Adam the liquor dealer. I tried to use the few available geographical names to see if they could distinguish the two Adam families. Not much light is shed. All the names still leave traces on a modern Google Map, but they are not densely collocated. The area is quite rural now and must have been even more so 150 years ago. The names and Post Offices mentioned above refer to townships or larger geographic administrative areas. Nonetheless, the farm of Adam Hasselbacher in Schapville is only 7 miles from the Elizabeth where Adam Hesselbacher had a liquor store and is buried. To make matters more interesting, when I scrutinized the 1893 map in more detail, I found a small farm in the northwest corner belonging to (as I read it) John Hesselbacher. Which John is this? Son of Adam and Margaret born between 1835 and 1845? Or was it John, son of Adam and Barbara who was born May 1870 making him 22 at the time the land map was drawn? I am only assuming that the Schapville farm belonged to Adam the farmer! The map from 1893 mentioned above was the earliest available to me. I later found other landowner plats. On the next one, the Adam Hasselbacher farm was owned by G.J. Anschutz, the first of later owners. John Hesselbacher owned his original land a while longer and acquired a much larger farm just north which remained in his family until at least 1987. I will detail and illustrate the changes in land ownership on another page. Of interest for this introduction is the fact that in 1963,the name of John's heir, Ernest Hesselbacher, was spelled Hasselbacher, an error corrected in later maps. This is an example of how name spelling errors creep in! I posted a number of maps between 1893 and 1994 on a separate page. 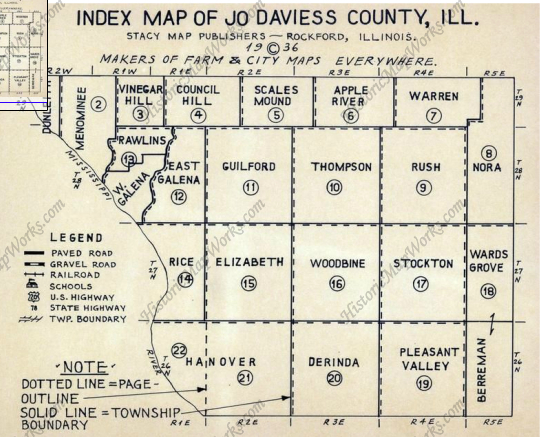 It seems clear that there were two families in Jo Daviess Co. with very similar names. One is clearly a Hasselbacher and the other seems to settle as a Hesselbacher. Were they related, or was their residence in this small area a coincidence? I am accustomed to seeing our name spelled differently all the time so the difference in spelling does not rule out a relationship altogether. However, it will take more information than we have now to make a link. I would be willing to bet however, that the two Adams knew each other! With luck, someone will find this and help us out. No doubt there are civil or church records somewhere that could help. To close the loop that began this article, might there be a connection to the family of Peter Hasselbacher of Peoria, and therefore to me? Peter himself thought he was the first of his family to have come to Illinois or perhaps anywhere in America. Adam was not an uncommon name among the Hasselbachers of Franconia, but I have not yet been able to place either of the Jo Daviess Co. families into the Hasselbacher Family Trees. Because I am still finding new Hasselbachers in the Aischgrund and surrounding Germany, I must to keep an open mind. I urge anyone with knowledge about these families to contact me below. Return to hasselbacher.org home page. Peter Hasselbacher, 26 Jan 2013. Contact me.